HI! Thank you for stopping at my booth. I hope you are able to find exactly what you're looking for. If you don't find it here today..check back again soon, I'm always adding new things. Let me know what it is your looking for, I may have it & just haven't listed it yet. I treat EVERY transaction the same, regardless of the amount of money spent. A $5 sale is just as important to me as a $100 sale. You will get the same level of customer service. Which, I hope you will see that I do try hard to make EVERY transaction a good one. I want all of my customers to want to come back again. I have noticed lately that there is a lack of customer service with many sellers..not just on Bonanza, but it seems like its everywhere. Some sellers out there act like They are doing YOU a favor by selling their items. I don't understand that way of thinking...Without customers, where is a seller going to be? Not selling that's for sure. A successful seller cannot have a successful business without customers...so why try to alienate them? Why make them feel unappreciated? When you shop with me, I hope you walk away knowing that I realize without you, I am not able to continue doing what I love...Selling online. Email me & I can tell you how you can start saving money every time you shop with me..I can also show you how you can start making money when you shop with me! You will also receive special offers & discounts. Be one of the first to see my new listings as well! Ok, enough reading...Let's go shopping!!! Click on my booth to get started! 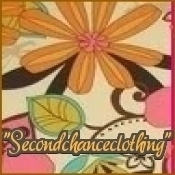 secondchanceclothing doesn't have any items in their booth! Awesome person to work with in every way. Truly enjoy working with her and so will you!!! Perfect Bonanzler! Great selection of clothing, constantly adding new stuff. Wonderful in every way.